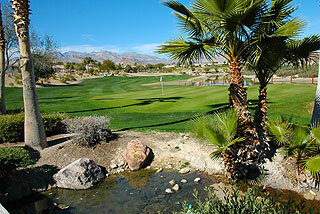 Siena Golf Club is fast gaining a reputation as one of the most enjoyable rounds of golf in the Vegas area. 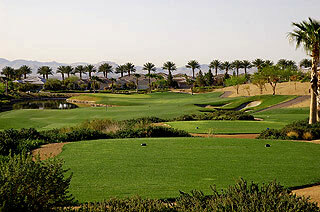 This Schmidt-Curly design features wide, playable fairways and undulating bentgrass greens, set amidst spectacular views of the Spring Mountains, Red Rock Canyon and the Las Vegas strip. The layout winds its way through native desert and lush landscaping, with six lakes and 95 white sand bunkers coming into play. Located on the outskirts of Summerlin and easily accessible from the Strip, Siena offers a fun challenge for golfers of all abilities, with 5 sets of tee boxes ranging from 6816 to 4941 yards. A great variety of shot opportunities are weaved into this championship layout, with carries over and around water hazards and desert mixed in with tee shots to wide open fairways of varying length and design. Most golfers will use every club in their bag on a round here, and will undoubtedly be impressed with the conditions and service. 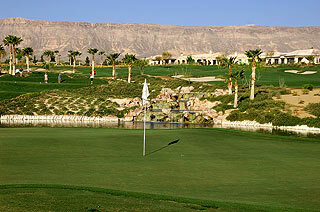 A complimentary grass range and use of a large putting/chipping green are included in the green fees, which are quite reasonable for a course of this quality in the Vegas area. On the 2 days we visited Siena, their parking lot was full and tee times were booked solid. Obviously, the word is out. 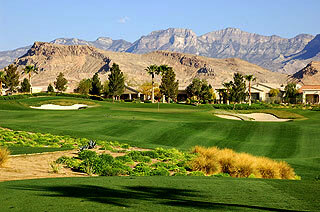 As with many courses in the area, Clark County residents receive special rates. They certainly recognize good value. A luxurious clubhouse was a work in progress when we visited, and is scheduled to open in the spring of 2002. The building design looks spectacular. When finished, this 13,000 square foot facility will host a complete pro shop, banquet facilities for up to 150 people, and a restaurant/lounge with an outdoor patio. 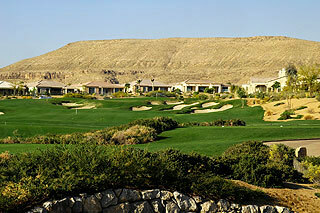 Currently, what you will find at Siena is a high quality golfing experience, and one that is very user friendly. Two forward sets of tees allow women, seniors and beginners a couple of choices. Mid handicap players can choose from tees playing to either 6135 or 6504 yards. The slope rating varies from 129 to 112. The greens are quite large with mild undulations. Fairway sprinkler heads are marked and different colored flags provide you with the days necessary pin placement information. Though not easy, Siena will not beat you up, if you can hit the ball somewhat straight. Experienced players will be challenged by the strategically placed water and desert hazards, and the plethora of sand bunkers. Nonetheless, there is a good chance to shoot your handicap (or better) here. The opening hole is a mid-range par four with fairway bunkers short right and long left. The approach plays to an elevated green. The green complex on number two is also elevated, and well protected with deep bunkers in front. The par five third features a rolling fairway that will funnel shots slightly off line towards the center. Fairway bunkers are also present on both sides. The long par 4 fourth is the number 1 handicap. An approach to an elevated green with bunkers left and behind the green provide the challenge here. Number five is a short par three, but is almost all carry over water. 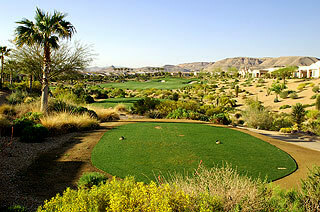 This is followed by dogleg left par 4 with numerous fairway and green-side sand traps. Beautiful mountains frame the green on the mid-range par three 7th. Traps on both sides and an undulating green are the main challenges here. This is a good birdie opportunity. The two closing holes are a bit more challenging. 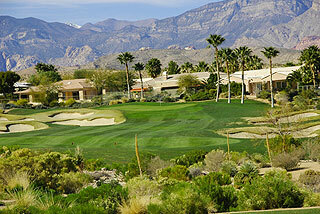 Eight is a par five that is open off the tee, but plays uphill on the approach to an undulating green. Coming in, the ninth plays very tight, with water left and bunkers right. The approach is also a narrow one. The back side features a wide fairway on the opening hole. Like many holes at Siena, the green complex is elevated and heavily bunkered. The eleventh is a short par four that will play longer as it is entirely uphill. A tight driving hole is next. This mid-length par five features water left off the tee, and sand and mounds to the right. 4 bunkers on the right and 1 left of the green will effect your approach. You can grip it and rip it on the par 4 thirteenth, which plays to another elevated green. Fourteen also plays uphill with rugged mountains as a backdrop. One club more is necessary to reach the green on what many consider to be the prettiest hole at Siena. Fifteen is also beautiful - a dogleg right over water with bunkers right and left. Stay to the left side of the fairway and to the right side of the green on the very short par four 16th, and you should score well here. Playing at just over 300 yards, the fairway and green-side bunkers are all that stands in the way of birdie. The easiest hole on the course follows. 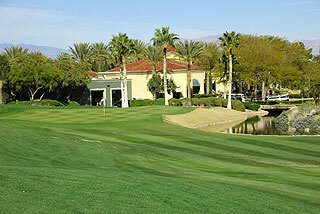 The green complex on this short par three is completely surrounded by traps and palm trees, with noticeable undulations. A well placed wedge or short iron could give you two birdie opportunities in a row. The final hole is very uphill off the tee with a treacherous fairway bunker on the right. Water right on the approach and an undulating green make this one of the toughest pars on the course. Siena is an extremely beautiful golf course that features more green than desert. One tip - avoid the rough as much as possible. You will find that it is very strong and penal. Keep it on the fairway and there is a good chance you will score well. Enjoy the scenery. Having a good sand game is also an advantage here. This is a highly recommended round of golf!